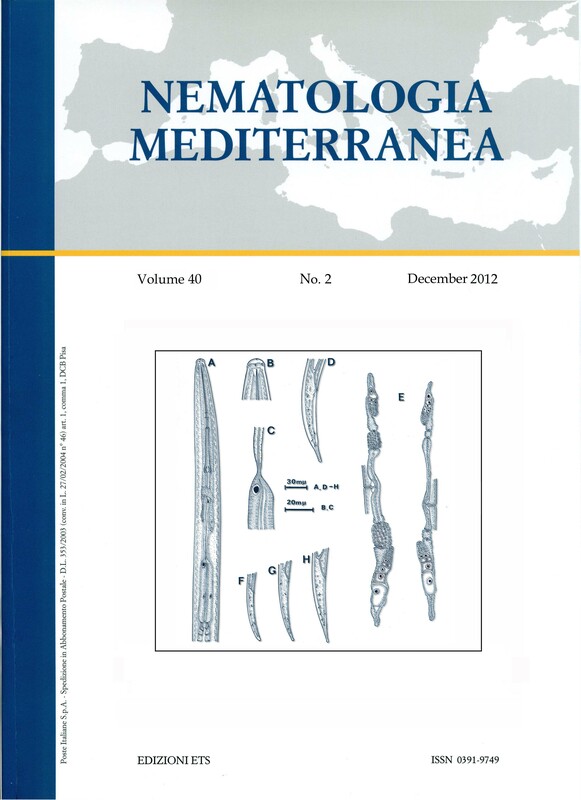 This year Nematologia Mediterranea is publishing its 40th volume. In 2004, when we accepted the hard work of editing the journal, we did it with enthusiasm. Just a few years later, because of cuts in the funding of research, the journal finds itself receiving no more support from the owner and its publication has been possible only thanks to the income from subscribers to the journal and to the generous contributions of several chemical companies operating in Italy; we thank all of them very much. Unfortunately, a situation that was supposed to last for a short time is still continuing. This does not allow us to ensure the publication of the journal in coming years. Therefore, we have decided to resigned as editors of Nematologia Mediterranea and leave to the owner of the journal, the “Consiglio Nazionale delle Ricerche” (National Research Council of Italy), the decision on the future of the journal; a decision that while this issue is being printed has not yet been taken. Despite these difficulties, our experiences as editors of Nematologia Mediterranea has been very rewarding because it has given us the privilege of sharing in advance the results of researches and to be in contact with colleagues from all over the world. Therefore, we are grateful to all authors who have trusted in the journal and in us by submitting their manuscripts for publication and we are sorry that any manuscripts had to be rejected; this was done solely with the aim of maintaining the high standard of the journal. If you, authors and readers, have enjoyed the journal, please realize that this has been possible because of the enthusiasm and hard work of all of the many helpful colleagues, most specifically members of the editorial board of the journal and of the many others who have accepted the responsibility of acting as referees. Their cooperation has been instrumental in putting manuscripts into good final shape. To all of them goes our special thanks and appreciation. Finally, we hope that all those of you who used to submit manuscripts to Nematologia Mediterranea will find other journals suitable for your publications. Drawing of Xiphinema mounporti sp. n. For more information see article by Faye et al. The last volume (Vol. 40) was published in 2012. Issue 1 (official publication date: 30 June	2012) and Issue 2 (official publication date: 30 December 2012). Nematologia Mediterranea is covered in the Thomson Scientific products and services and is indexed by Biological Abstracts, BIOSIS and Zoological record. The journal is also abstracted in C.A.B. Nematological Abstracts and indexed on this Web site. Scientific articles that report on original researches. Technical reports: articles relating to new technical developments and approaches in the study of Nematology. Short communications: brief articles dealing with subjects that do not require long discussion, such as indications of the occurrence of important nematodes in regions where they had not been previously observed, or the discovery of new hosts for plant parasitic nematodes. Review articles: comprehensive review of current knowledge in various disciplines of the plant protection sciences with particular reference to Nematology. Abstracts: symposia and meetings, in consultation with the Editors. Authors are invited to submit papers that correspond with the scope and topics of the journal. Articles, written in English, French, Italian, Portuguese or Spanish, should be submitted to Dr. Nicola Greco, at the above cited address, preferably as e-mail attachments. Each one should be accompanied by a summary written in the same language, but an english summary is also required if this is not the article language. Articles will be accepted subject to approval by the Editorial Board who will refer to specialists as required. The contact author will receive 50 reprints free of charge. Nematology. A merging of Fundamental and Applied Nematology and Nematologica. The WWW Virtual Library: Journals, Conferences, and Current Awareness Services. Take a look!! INTRODUCTION TO NEMATODES: A NEW MULTIMEDIA PRESENTATION. by McGawley et al. (Please, send me an email:( f.elia@ba.ipp.cnr.it) if you know other nematology journals on the Web). Harpenden, Herts AL5 2JQ, U.K.